If guests aren’t enjoying themselves at your event, it is unlikely to be a success. This is obvious, but what may not be as obvious is the solution to help improve the experiences of event attendees. 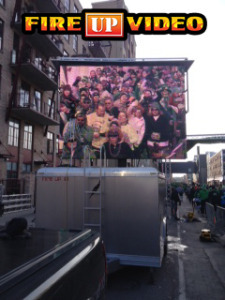 This could be accomplished by renting a mobile Jumbotron LED screen at the event to help get the crowd more pumped up. Fire Up Video provides LED mobile screen rentals for events all over the Midwest, in an attempt to make every event that much better than it already is. We work hard to bring every event we attend to the next level, and have the feel of a much larger event with the presence of our Jumbotron video walls. And a major part of improving any event is to get the crowd involved and make sure they are having a good time. Our big screen TVs do just that. The mobile LED screens give everyone a front row view of the action. Even someone who is the very back will get a close up look of everything that’s going on, and will feel like they are more a part of the event. The video board can be used to display live action to pump up the crowd, or pre-recorded video to do the same thing. Guests love seeing action around them on screen, but one thing they like even more than that is to see themselves on the Jumbotron. When we aim our cameras into the crowd, everyone goes crazy when they see themselves on the big screen. Even when the Jumbotron LED screens aren’t being used for live video production, they can still be used to improve experiences of your visitors. Whether it is announcements of the event or organization, pre-recorded video, sponsor videos, or just about anything else, the screens can make any event better. The LED TVs also give off the feeling of a larger event and make for a better overall experience. Fire Up Video offers Jumbotron mobile LED services all over the Midwest to all varieties of events. We rent our mobile screens for events in states such as Minnesota, Wisconsin, Michigan, Indiana, Ohio, Tennessee, Kentucky, Colorado, Kansas, Missouri, Illinois, Iowa, Nebraska South Dakota, North Dakota, and more. If you have any questions or would like to rent a screen for your next occasion, please contact us at 844-533-8848 or baum3@earthlink.net.